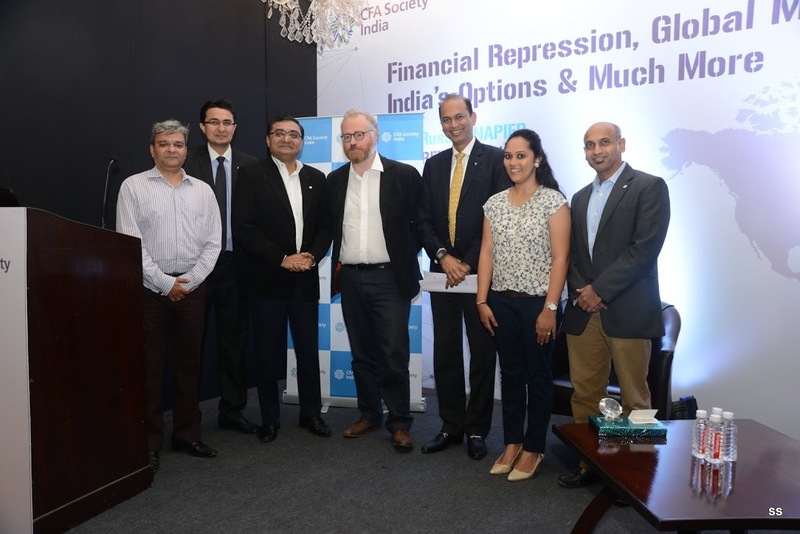 IAIP and Reliance Mutual Fund organized a session on “Financial Repression, Global Macro, India’s Options and much more” by Russell Napier in Mumbai on October 24th 2016. The event was well attended by the participants. Financial repression is a term used to describe measures sometimes used by governments to boost their coffers and/or reduce debt. These measures include the deliberate attempt to hold down interest rates to below inflation, representing a tax on savers and a transfer of benefits from lenders to borrowers. It is generally characterised by government resorting to ownership or control through financial regulation (forcing banks to hold govt. debt), credit controls, politicisation of credit, government mandated interest rates, capital controls, restricted investment list, transaction tax, capital levy, dividend controls etc.. Historically, real GDP growth rates fall above a particular level of Debt to GDP ratio. History of austerity is history of politicians – politicians may not want choose it. Default would not be a sought after solution for its obvious reasons. For 40 years financial industry has geared up and levered. No correlation has been observed between GDP and return on equity because of supply of capital. Balance sheet of central banks have ballooned with debt, contractions of which may not be an easy option. Considering this, investments should be targeted in jurisdictions where repression is not necessary. For instance, key emerging economies as they have relatively lower level of debt. Emerging economies with too much foreign currency debt should be avoided. This entry was posted in Mumbai, Speaker Events and tagged Anil Ghelani CFA, CFA Institute, Financial Repression, Global Macro, IAIP, India's Options, Indian Association of Investment Professionals, Jayesh Gandhi CFA, Kishor Bagri CFA, Rajni Dhameja CFA, Russell Napier, Shreenivas Kunte CFA, Sunil Singhania CFA. Bookmark the permalink.